Every observant coastal visitor has noticed at one time or another the large bird of prey with white breast feathers diving on unsuspecting fish that linger too long near the waters surface. That would be the Osprey (Pandion haliaetus), often called fish eagle, sea hawk or fish hawk. It is a medium sized raptor with a cosmopolitan range (nearly worldwide) that reaches 24 inches in length and 71 inches wingspan. It is the second most widely distributed raptor species, after the peregrine falcon. Osprey are truly an impressive bird and has an unmistakable shrill whistle call. Originally described by Linnaeus in the 18th century it is the sole member of the genus (and the family) and occurs worldwide under one species name but four subspecies. Its diet is predominantly fish and it has special physical characteristics that maximize its ability to catch and hold slippery fish. Unlike most birds (other than owls) that have only one opposable toe, the Osprey has two that insure a tight grip on its catch. Like many diving birds, the Osprey also has the ability to close it nostrils during a dive on a fish. It nest close to water in trees or nest platforms erected near water as often seen along coastal areas. Osprey usually mate for life (lifespan generally 7-10 years) with the female laying 2-4 eggs per clutch. The photograph of this mated pair was taken near a wetland area on Sanibel Island, Florida. Apparently they had one or more young in their nest as they periodically left and returned with a fish in their talons. I was some distance away but the 600 mm lens brought them in close enough for the picture. It is interesting to note that much in folklore has been written about the Osprey. 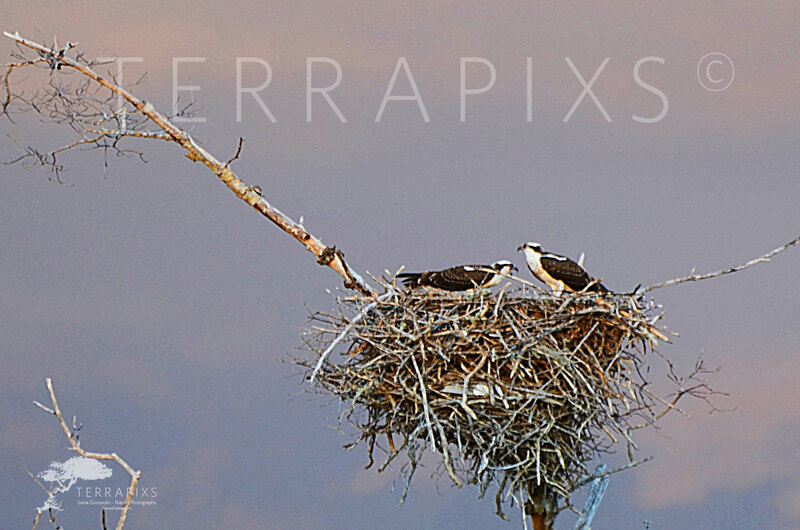 The Roman written Pliny the Elder reported that parent ospreys made their young fly up to the sun as a test, and dispatched any that failed. In medieval times, there was a belief that fish were so mesmerized by the osprey that they turned belly-up in surrender. In any event, if you encounter an osprey stay a while and watch its graceful flight and very efficient fishing technique. As always, enjoy and protect mother nature for she supports us all.